Physicists in the Syracuse University College of Arts and Sciences have made science history by confirming the existence of a rare four-quark particle and discovering evidence of three other "exotic" siblings. Their findings are based on data from the Large Hadron Collider (LHC), the world's biggest, most powerful particle accelerator, located at the CERN science laboratory in Geneva, Switzerland. Professor Tomasz Skwarnicki and Ph.D. student Thomas Britton G'16, both members of the Experimental High-Energy Physics Group at Syracuse and the Large Hadron Collider beauty (LHCb) collaboration at CERN, have confirmed the existence of a tetraquark candidate known as X(4140). They also have detected three other exotic particles with higher masses, called X(4274), X(4500) and X(4700). All four particles were the subject of Britton's Ph.D. dissertation, which he defended in May and then submitted, on behalf of the LHCb collaboration, as a journal article to Physical Review Letters (American Physical Society, 2016). A tetraquark is a particle made of four quarks: two quarks and two antiquarks. Tetraquarks—and, by extension, pentaquarks, containing five quarks—are considered exotic because they have more than the usual allotment of two or three quarks. "Even though all four particles contain the same quark composition, each of them has a unique internal structure, mass and set of quantum numbers," says Skwarnicki, who, in April 2014, confirmed the existence of the world's first charged tetraquark candidate, called Z(4430)+. A year earlier, he and Ph.D. student Bin Gui G'14 determined the quantum numbers of the first neutral, heavy tetraquark candidate, X(3872). Quantum numbers describe each particle's subatomic properties. Skwarnicki says the measurement of all four particles is the largest single one of its kind to date. Unlike other exotic particle candidates, his and Britton's do not contain ordinary nuclear matter (i.e., quarks found in protons and neutrons). "We've never seen this kind of thing before. It's helping us distinguish among various theoretical models of particles," Skwarnicki says. A fellow of the American Physical Society, Skwarnicki is a longtime member of the LHCb collaboration, involving approximately 800 other scientists from 16 countries. Their goal is to discover all forms of matter, in hopes of explaining why the universe is made of it, instead of anti-matter. Skwarnicki's work focuses on quarks—fundamental constituents of matter that serve as a kind of scaffolding for protons and neutrons. While most particles have two or three quarks, Skwarnicki and others, in the past decade, have observed ones with four or five. Last summer, he and doctoral student Nathan Jurik G'16 teamed up with Distinguished Professor Sheldon Stone and Liming Zhang, a professor at Tsinghua University in Beijing, to announce their discovery of two rare pentaquark states. The news made headlines, thrusting Syracuse and CERN into the international spotlight. According to the Standard Model of particle physics, there are six kinds of quarks, whose intrinsic properties cause them to be grouped into pairs with unusual names: up/down, charm/strange and top/bottom. The particles that Skwarnicki and Britton study have two charm quarks and two strange quarks. Charm and strange quarks are the third- and fourth-most massive of all quarks. That all four quarks in the new family are "heavy" is noteworthy. "The heavier the quark, the smaller the corresponding particle it creates," says Skwarnicki, adding that the names of the particles reflect their masses. "The names are denoted by mega-electron volts [MeV], referring to the amount of energy an electron gains after being accelerated by a volt of electricity. ... This information, along with each particle's quantum numbers, enhances our understanding of the formation of particles and the fundamental structures of matter." Evidence of X(4140) first appeared in 2009 at the Fermi National Accelerator Laboratory, outside of Chicago, but the observation was not confirmed until three years later at CERN. A rendering of the enormous LHCb detector, which registers approximately 10 million proton collisions per second. Scientists study the debris from these collisions to better understand the building blocks of matter and the forces controlling them.Extremely rare and four times heavier than a proton, X(4140) has been initially detected only 20 times out of billions of man-made energy collisions. LHCb is uniquely suited to study such particles, and thus, has gone on to detect X(4140) nearly 560 times. Skwarnicki attributes the discovery of X(4140)'s three siblings, culled from LHCb data from 2011 to 2012, to increased instrumental sensitivity. It is the energy configuration of the quarks, he explains, that gives each particle its unique mass and identity. 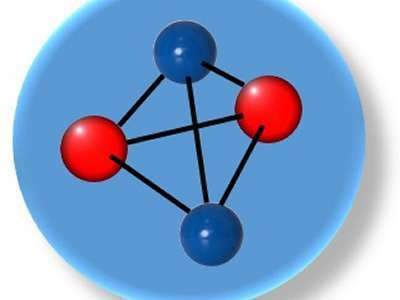 "Quarks may be tightly bound, like three quarks packed inside a single proton, or loosely bound, like two atoms forming a molecule," Skwarnicki says. "By examining the particles' quantum numbers, we were able to narrow down the possibilities and rule out the molecular hypothesis." A snapshot of LHCb detector data, singling out the collisions that have resulted in the four tetraquarks.Not that the process has been easy. An "aporetic saga" is how Britton describes studying molecular structures that seem to "jump out of the data." "We looked at every known particle and process to make sure that these four structures couldn't be explained by any pre-existing physics," he says. "It was like baking a six-dimensional cake with 98 ingredients and no recipe—just a picture of a cake." Meanwhile, Skwarnicki, Britton and others face the onerous task of combing through data and developing theoretical models, in an attempt to confirm what they have seen. "It may be a quartet of entirely new particles or the complex interplay of known particles, simply flipping their identities," Skwarnicki concludes. "Either way, the outcome will shape our understanding of the subatomic universe." Phycists today just have no clue of the true nature of subatomic structure. Antiquarks are a form of antimatter, I thought, so it doesn't seem like you're going to prove that the universe is made of matter instead of antimatter. Which of the 4 quarks in a tetra quark are matter and which are antimatter? It contains a charm quark, a charm antiquark, a strange quark, and a strange antiquark. As far as the matter/antimatter imbalance, a combination of a strange and a charm, one quark and one antiquark, is a D-strange meson. Now, ever since the 1960s, physicists have known that the neutral K meson (usually called a kaon) has two flavors. One is a combination of a strange quark and a down antiquark, and the other is a down quark and a strange antiquark. This meson is unusual; it has two decay modes, one short and one long. After a great deal of calculation and experimentation, it was determined that the decay violates CP symmetry, or T symmetry. Physicists have gone on to show that there is also CP symmetry violation in the B meson and, most recently, the D-strange meson. What's important here is to understand that the tetraquark discovered in this article is two D-strange mesons. The next experiment will be to find out whether its decay modes also violate CP symmetry. They almost surely do. And if that's the case, then we may have found the reason for the matter-antimatter imbalance. It all depends on how much CP symmetry violation they show. Furthermore, previous calculations of whether the observed CP symmetry violations are sufficient to account for the imbalance were based only on the amount observed in the kaon sector; adding the B and D sectors, plus these tetraquarks, plus other possible tetraquark combinations, might just account for it. So that's why they're talking about finding the reason for the matter-antimatter imbalance, and why this discovery may hold the key to unlocking it. A Nobel Prize may eventually be awarded for this work; if it leads to an explanation of the matter-antimatter imbalance in our universe, it is all the more certain. This may be one of the most important discoveries in physics ever. But there's a lot of theory to be worked out between here and there. I think Feynman had the explanation but people would rather not believe it. His view was that antimatter is matter moving backwards in time, at least as I remember the lecture. So apparently all the antimatter made during baryogenesis was recycled back to photons. Last time I looked for the Feynman lecture I couldn't find it though. I'd be with you except for the neutral kaon decays, and finding the same thing for the B and D mesons. I also think that it's a bit unclear exactly what Feynman had in mind. We can after all observe actual positrons and they follow all the laws of physics; no sign of any time-reversal there. If you use a negative value for the time in the spherical wave equation you get an equal and opposite phase change, i.e., antimatter. See Quantum Physics: Richard Feynman, scroll down to "The Puzzle of Antimatter: 'Positron moving backwards in time'"
Demonstrating the reality of reflection from all parts of the mirror shows that there is an amplitude for every way an event can happen. So light doesn't really travel only in a straight line; it smells the neighboring paths around it. We can after all observe actual positrons and they follow all the laws of physics; no sign of any time-reversal there. Feynman's example was a cyclotron where the electron goes around one way and the positron the opposite. So apparently the positron is going back to where it thinks it would come from. The dark energy concept was always black magic in my mind. Where would this stuff come from? Feynman may be onto something. It's borrowed energy from negative time, similar to antimatter could be thought of as borrowed from negative time. Maybe they will begin to balance the books and cut out the black magic? Einstein wanted to treat all four dimensions on the same footing. If so time is expanding in both directions just like the spatial dimensions. I mentioned somewhere on a blog the term anti-time. You should have seen the sparks fly from the Physics Police. @Proto, yes, I've read QED: The Strange Theory of Light and Matter. More likely the positron is proceeds along its path in backwards time while the electron proceeds along its path in forward time. Since both directions coexist in the same universe, going back to the past in forwards time cannot occur without boing back to a similar amount of the past in backwards time. The important distinction is going back to the past for forward time is not equivalent to going forward in backwards time. The basic premise for Feynman's statement that antimatter moves backward in time is from GRT, and specifically from the CPT symmetry. Since charge (C) and parity (P) are reversed in antimatter, in order for CPT symmetry to be preserved time (T) must be reversed as well. CPT symmetry in QM is dual under Noether's Theorem to Lorentz symmetry in SRT, so a violation of CPT symmetry is taken to be a violation of Lorentz symmetry. While C, P, and CP violations have been observed in the action of the weak force, no violation of the overall CPT symmetry has ever been seen in any experiment. The dark energy concept was always black magic in my mind. Where would this stuff come from? It is in the EFE (that is, in GRT). It is the Λ term in the EFE, also called the cosmological term. This is fundamental in the ΛCDM cosmologies that are currently widely accepted in the astrophysics and cosmology community. Feynman may be onto something. It's borrowed energy from negative time, similar to antimatter could be thought of as borrowed from negative time. Maybe they will begin to balance the books and cut out the black magic? It's possible that this is a restatement in different terms of cosmological constant, but I'd have to do a lot of analysis to confirm or deny this hypothesis. I'll also point out that even if it is, it's not a statement that dark energy "doesn't exist," but instead a confirmation that it does. Actually, the whole point is that matter cannot be converted into antimatter without violating Lorentz symmetry; since we are made of matter, and all our instruments are as well, we will always observe forward time. And due to CPT symmetry, all our observations will be consistent with the laws of physics no matter which way we look at them. It is only in the weak interactions, and only in some of them, that we see partial violations, like of C and P and CP; and these only introduce matter-antimatter asymmetry. They are not sufficient to introduce time asymmetry into SRT. So for antimatter we may have to reverse the sign of the cosmological constant. For Newtonian gravity, at least, that would mean antimatter experiences antigravity. Certainly matter is not converted to antimatter because it's formed in particle-antiparticle pairs. No transgender operations occur. But we do observe positrons with our instruments made of matter, and to us they appear to be moving in negative time as we move in forward time. We occupy the same space but just not the same time. This doesn't mean antimatter interacts gravitationally with matter. If they do interact the energy borrowed to create the particle-antiparticle pair is returned. If they do interact the energy borrowed to create the particle-antiparticle pair is returned. Of course quarks and anti-quarks do interact to form short lived mesons or other exotic particles. The reason for this is the uncertainty principle. Apparently between ticks of the cosmic clock it doesn't make any difference which way they go in time. Not known from experiment yet, but it's expected that gravity will affect matter and antimatter in the same way. But we do observe positrons with our instruments made of matter, and to us they appear to be moving in negative time as we move in forward time. No. We observe antimatter as we observe all things, and if antimatter is moving backward in time, we can't tell the difference because physics is time-reversal symmetric (except in the weak interactions). Time-reversal symmetry means that it's not really clear what it means to say antiparticles are "moving backward in time." We occupy the same space but just not the same time. No. If this conjecture is correct, then we occupy the same time but progress along it in different directions. Of course quarks and anti-quarks do interact to form short lived mesons or other exotic particles. Mesons are not exotic. Nuclei hold together because the protons and neutrons exchange pions. There are pions, therefore, in every piece of matter around and in you. The reason for this is the uncertainty principle. Apparently between ticks of the cosmic clock it doesn't make any difference which way they go in time. That's not why. It's because of time-reversal symmetry as I said above. What I meant was, as I understand Feynman, we can observe particles occupying the same region of space, like in a cyclotron, while they move in opposite directions in time. No, actually a particle and its antiparticle cannot occupy the same space at the same time. They still interfere destructively creating Pauli exclusion. This is disregarding the fact they will annihilate. Same idea for pions, another short lived particle. Time-reversal symmetry probably doesn't mean anything between ticks of the cosmic clock. So that's why I said the same region of space, not the same point in space. ...it's expected that gravity will affect matter and antimatter in the same way. Since the e/m field affects matter and antimatter in the opposite way, I wouldn't bet the family farm on it. Feynman talked about mechanical clocks running backwards in time due to thermal effects. But this is only time read off the dial of the clock. In fact Brownian motion may occur in four dimensions in which case particles actually do move in reverse time. A particle always does have a finite vector for moving backwards in time as I understand. But this doesn't change the gender of the particle, at least for very long.